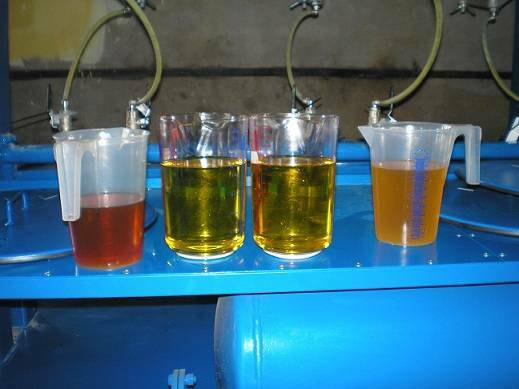 Combined Method of Used Oil Purification. A particular purification method is chosen depending on the amount and the degree of the used oil’s contamination. If oil is contaminated only with mechanical impurities, then it may be enough to carry out a simple purification. But sometimes, oil that is very contaminated should be processed by chemical reagents. Physical methods provide for removing only mechanical impurities such as sand, dust, metallic particles, resinous, and coke-like and carbon materials. In this way, the chemical base of the oil being processed remains unchanged. In practical terms, physical methods such as sedimentation, filtration, centrifugal separation, distillation of fuel and water washing have gained a widespread acceptance in the industry today. Sedimentation is considered to be the first, and a necessary stage of the purification process. It consists in quiescent sedimentation of mechanical impurities and water that are in a suspended state. In this case, gravitational force plays a very essential role. According to the Stokes equation, we may say that the greater size and the specific weight of the mechanical particles, the faster the mechanical particles will settle down. Metallic particles, resinous substances and coke-like materials are more likely to settle down than any other substances. It is worth mentioning that the used oil sedimentation method does not always lead to the desired effect. Sometimes, even when the processing time is increased, the majority of the impurities will remain in a suspension phase. This always happens when purifying used diesel and automobile oils that contain dispersing additives as well as oils that are contaminated by finely divided additives. Separation features a centrifugal process. Centrifugal forces exert influence on the heaviest particles that tend to be drawn to the vessel walls thereby forming a circular sedimentary horizon. The second sedimentation layer consists of water when the third one – of purified oil. Filtration consists in separating inhomogeneous systems with diffusion barriers. They are able to retain some particles and at the same time give way to other particles. Fuel distillation is applied when processing oils from internal combustion engines. It is impossible to obtain oil of the necessary viscosity and with the required flash point without fuel distillation. The difference between boiling temperatures of oil and fuel is the basis for fuel distillation. When heating up the used material, the fuel, and then oil, will start to evaporate. When oil fractions start evaporating, the heat should be removed. Water washing is applied if oils need to be cleaned from acid products (water-soluble low-molecular acids and soaps). Water washing however, will not restore the performance characteristics of oil completely if it has become old and highly contaminated. When acids are dissolved, water is separated from oil at 60ºС in the course of using the separation method. Surface-active colloids and hydrophilic high-molecular compounds. The following is a description of a common coagulation procedure. At the first stage, oil is heated up to between 75º and 90ºC and then is blended with a 10% solution of coagulant for between 20 and 30 minutes. Then it is allowed to settle down for 2 days. Oil is treated on a special equipment after the sediments are removed. Adsorption consists in retaining impurities on the surface of adsorber material. The latter is able to retain asphaltic resinous substances such as acid compounds, ethers and other products of aging. The distinctive feature of this method is that it is easy-to-perform and can be used to purify the majority of the used oils. Substances such as silica gel, aluminium oxide, bleaching clays and silica-alumina catalysts may serve as adsorbents. The majority of them are artificial and very expensive. Bleaching clays however, are an exception since they have good adsorption properties and are typically derived from deposits commonly found most everywhere in the Earth. Sulfuric Acid refining is one of the oldest, but still one of the most effecive methods of oil purification. It is used in the oil industry to remove asphalt resinous substances, acid containing and sulphur containing compounds, as well as other hazardous impurities. Sulfuric acid refining results in obtaining a substance that is divided into two liquid phases. On top, there is acid oil and on the bottom, an acid sludge. Almost all hazardous wastes (except organic acids) are removed from the used oils together with acid sludge though the majority of the oil’s carbons will remain unchanged. a final phase of sulfuric acid refining. Usually, caustic soda, calcined soda and trisodium phosphate are required to carry out the alkali purification. As a result of the purification, there are sodium salts (soaps) that can be easily turned into the alkali solution. Additionally, soaps are usually easily and well dissolved in hot water. When alkali purification is complete, oil should be allowed to settle down. 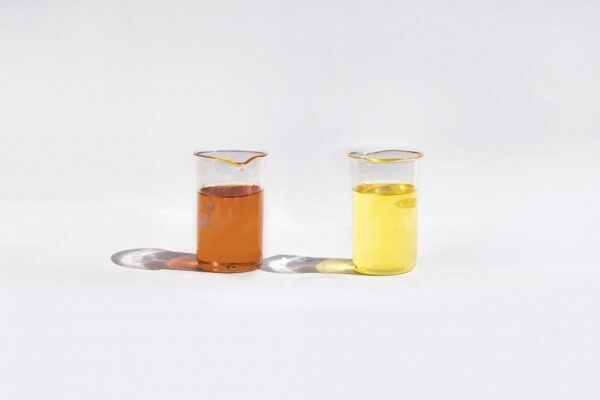 Taking everything into consideration, it is clear that oil should be processed by more than one recgonized method to obtain the desirable effect of the purification process. In practical terms, a combination of methods is applied to purify oil. GlobeCore is in the business of purification and regeneration of different types of mineral oils using classical as well as new and innovative methods. GlobeCore’s advanced technology provides for the complete restoration of the performance characteristics of dielectric oil and other industrial oil and fluids while at the same time reducing operating costs and maintenance costs. With GlobeCore equipment, you will be able to reduce your need to spend money on new oil purchase since regenerated oil is restored to its new like condiction and des not need to be replaced with expensive new oil. The fact that GlobeCore equipment is environmentally friendly is of great benefit to the power transmission industry. GlobeCore oil purification units produce no hazardous waste. Adsorbent materials, used in GlobeCore equipment, are reactivated directly in the unit and may be used for between 2 and 3 years before being disposed of as non-hazardous waste.